How do I know if I have enough science background to participate in any of the SSA courses? It is recommended that students have at least a year of high school science before participating in any SSA course. However, if a student will not have a full year of science coursework prior to the summer sessions but is highly motivated, please contact us to discuss options. What is the latest date I can register for a Summer Science Academy course? Admission to the SSA is on a first-come-first-served basis. We accept applications until the course fills or one week prior to the start date of the course. What are some of the nightly activities included in the programs for resident campers? Some of the nightly activities include movie night, game night, cook out, invited speakers and educational demonstrations. Can I participate in more than one course? Yes, students can only enroll in one course per session, but students can register for multiple sessions. If a student is flying in to attend the Summer Science Academy how does he/she get from the airport to McDaniel campus? There is an option in the registration process to include round-trip shuttle transportation from BWI to McDaniel campus for an additional fee. What does the daily schedule for Summer Science Academy look like? Download the sample schedule to view the agenda for a typical day at Summer Science Academy. Get a $40,000 McDaniel Scholarship! 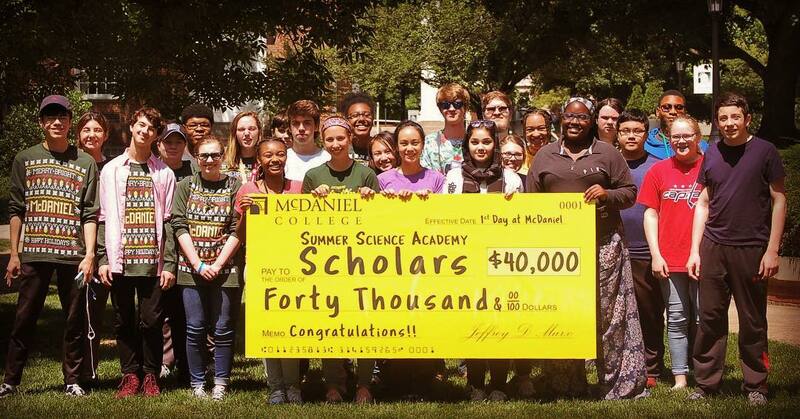 Students who successfully complete at least one session of the Summer Science Academy and who have not already been admitted to McDaniel College will receive a guaranteed minimum $40,000 scholarship to attend McDaniel College as an undergraduate.